Laparoscopy ─ modern method is classified as minimally invasive surgery, which can be applied for both diagnosis and for therapeutic procedures. The name of the intervention comes from the Greek word «laparo», which means «stomach» and, therefore, the operation is performed on the organs of abdominal cavity and small pelvis. 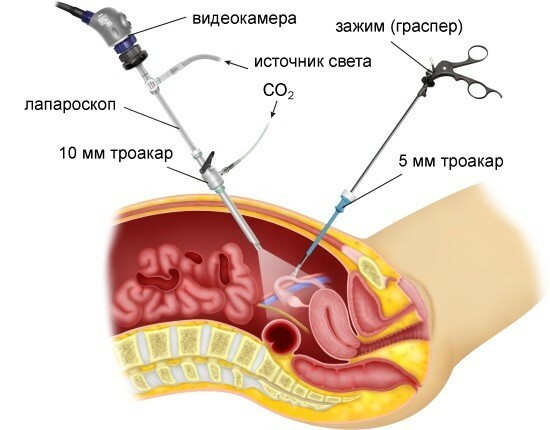 Then we will talk about what is a laparoscopy, about its capabilities and contraindications, peculiarities of the method, and what is necessary to pass tests before laparoscopy. More and more operations become available laparoscopically, and therefore, they take less time, less traumatic and less painful than open intervention, and gives the skin a minimal incisions. They help to minimize the time spent in hospital, and the modern tools used for their implementation, ensure high precision of ongoing manipulations. Many gynecological: infertility, endometriosis, uterine fibroids etc. Suturing of perforated ulcers of hollow organs (stomach, 12 duodenal ulcer). Resection of the stomach, 12 duodenal ulcer, intestinal. Removal of tumors of the abdominal cavity. Dissection of adhesions in the abdominal cavity. The above are just some of the types of surgical interventions. Over time and with the advent of new tools and techniques for expanding the spectrum of pathologies in which it is possible to use laparoscopy. Diagnostic, in which it is possible to identify a specific pathology. Treatment. During such operations, the elimination of anomalies of the structure of organs, tumors and perform other necessary manipulations. Control. During which the controlled operation, there are the results. In the process of the procedure the goal of surgery may vary, for example, the diagnostic or control laparoscopy can be therapeutic. The presence of bleeding in the abdominal cavity (eg, ectopic pregnancy, perforation of the uterus). Torsion of the neoplasm (e.g., ovarian cysts). Acute suppurative process in the pelvis in women. Closed abdominal trauma in polytrauma. The operation is not performed during menstruation. Often laparoscopic surgery is performed in the first phase of the cycle or just after ovulation (especially if it’s surgery for infertility). Also, such operations are not carried out in the period of acute inflammatory diseases, with extensive adhesive process in the abdominal cavity, severe cardiac or respiratory failure and other decompensated comorbidities. Indications and contraindications, ultimately determined by the attending physician, based on possible benefits and anticipated risks for the patient. Wasserman, blood for HIV, hepatitis B and C.
Blood for blood group and RH factor. Fluorography (valid for 1 year). Feces on eggs of helminths. Women need to take a swab from the vaginal flora and to consult a gynecologist. 2 weeks before the operation to be commissioned by CBC, urine analysis, coagulation. The doctor must be informed about the availability of allergic reactions to certain types of medicines. 5 days before the day of the operation it is advisable to stick to a diet with restriction of products that contribute to increased gas formation in the intestine, namely, to eat less of cabbage, bean, black bread. On the eve of surgery cleansing enema, if necessary ─ and also in the morning. 12 hours before the alleged interference is not to take food or water. To undertake the surgery need a General anesthesia. After the introduction of the patient anesthetized the abdominal cavity is filled with carbon dioxide, thus resulting in a better view of the abdominal cavity, and receiving a vast space for manipulation. Telescope with camera and special lights and instruments manipulators are inserted through a small hole in the abdominal wall. After the surgeon with all the necessary manipulation of the tools are retrieved from the abdominal cavity, sewn with a hole for their introduction. After the intervention an important early activation of patients. To get up sometimes after a few hours after surgery. Better to start with short trips, gradually increasing the duration and load, smoothly returning to his normal life. If necessary, the doctor will prescribe painkillers that will relieve the pain. 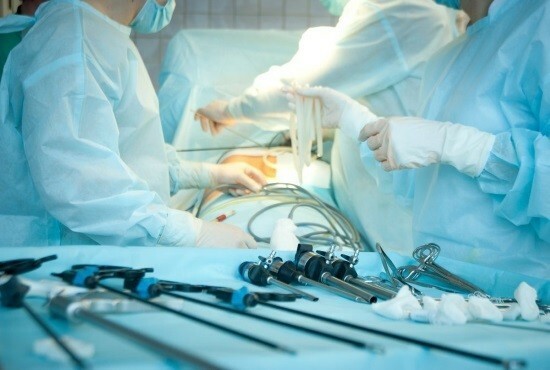 Usually discomfort in the area of application of the tools goes away after a couple of days after laparoscopy, and after 2-3 days the patient can be sent home, if intervention were conducted in the hospital. The whole recovery period should take place under strict medical supervision to avoid complications.